The interior design of your self-build home should not left until after the house has been built. Everyone has their own ideas of what they require within their home and if this is not conveyed to the person drawing up the plans not only will it be too late to change them alter but could lead to disappointment. Hold a family meeting of all those that are likely to live in the house once it is built. Ask them what they think should be important within the house. Obviously indoor swimming pools and gyms may not be possible in a small bungalow but take all suggestions seriously and then give the list to the architect numbering them in order of importance. Luxuries such as hidden hi-fi speakers in each room, specialist lighting and vacuum cleaner systems built into each room with a central dust collection are desirable items that the self-builder is able to integrate into the house whilst it is being built. Obtain the specifications for these goods and ensure that any wiring and ductwork is integrated into the blueprint of the house at the planning stage and your contractors are able to fit these luxuries. If the item you are fitting is beyond the capabilities of your workers enquire if the supplier has skilled staff and is able to provide an installation service. Bespoke kitchens, bedrooms and bathrooms are not only desirable but will help sell the property whenever you are ready to move on. The craftsmen who provide this service are very much in demand so do not leave it until the last moment to book their services. Specialist items such as sunken baths may need reinforced flooring before they can be fitted. Liase with the supplier, architect and building regulations department to ensure that the reinforcements are adequate. A little forward planning will save money and grief much later. Collect samples of fabric, carpeting and paint colours and put them onto boards that can be pinned onto walls and viewed during the build. However much you favour a certain style and colour consider whether it is really suitable for the room or design of home. The same can be said of brickwork, tiles and even paving for the driveway. Visit showrooms at every opportunity along with home exhibitions, museums and specialist stores. Look to see how colour schemes and furniture is put together. Would this suit your home? Could your young family live with it? 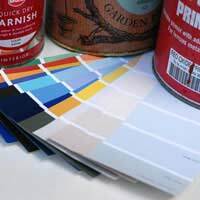 Paint manufacturers, kitchen companies and bedroom suppliers all have staff on online services that will show your colour scheme and furniture choice in a 3D layout. When considering using a new product or specialist item negotiate for a discount. The supplier may take a substantial amount off the bill in exchange for naming your home or featuring it in an advertisement. A home featured in a design magazine would help when the time came to sell the property. If you are able to self-build your home but you find that the actual interior design of the home is beyond you employ the services of an interior designer. These people are not cheap but the end result could be well worth the expense.